Getting older is inevitable as long as we are alive. How do we manage this ongoing process? How do we feel about it in ourselves and regarding others? Do we see it as a series of losses or can we also see the huge gain which comes to us with the years of lived experience? How does our society, our culture address the later stages of life? Is it inevitable that older people are seen and managed in the way we see today? Is there another way to care and be cared for? How can we co-create our life actively – and not only older years – instead of following the blueprints of our culture like sheep to the slaughterhouse? What is needed from us and others so as to gain a broader view on our personal and collective stories? These and many other questions will be discussed on this site, videos and articles posted which we and our collaborators write or find online or offline. We don’t intend to give any conclusions or recipes, but encourage you to explore your own life, your desires, your purpose and how you can go on in your very best way. We want to be there with you, support you, answer your questions, invite you into a dialog, create a movement for a life worth living. 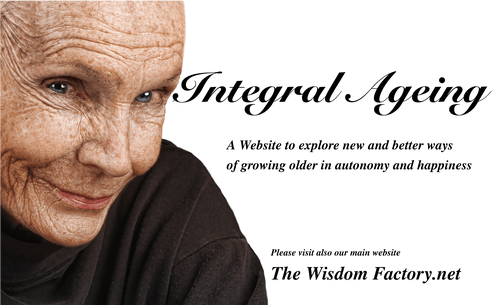 Our intention is to create this website as an archive for interesting publications on the topic AGEING, especially seen from an integral and evolved perspective. We include material we find on our Facebook page, and also things we find on the web which seem to be relevant to us. If you have content to share, your own article, video or pictures, also art and music related to the topic, please contact us directly and we will be happy to publish your material here. Thanks Heidi for this wonderful post. The vainness of the present society wants to make us believe that getting old is a kind of illness that must be cured. Yet getting old is a NATURAL part of living, and we can all grow old gracefully and be proud of it. The world definitely needs this kind of education. Please keep it up. Thank you so much, Lanu, for your encouragement. Yes, I believe that getting older is nothing to be ashamed of and that, at the contrary, there are many gains to it. We will talk about that in our next episode on Friday 25th with Jon Freeman, the author of “The Science of Possibility”. I definitely feel much better now in comparison to my young years which were full of confusion and disappointments.